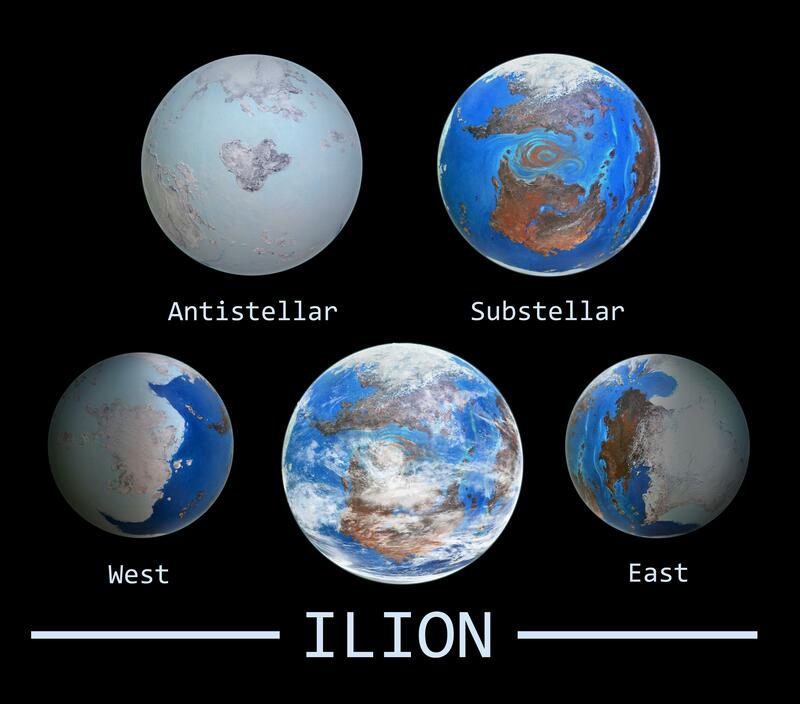 Top left: Ilion’s antistellar (dark) side. At the center is Mentes, Ilion’s smallest and only lifeless continent. Top right: Ilion’s stellar side, showing the continents Pandaros (bottom) and Deiphobus (top). Bottom left: The continent Polyxena at the west terminator. Bottom center: The stellar (light) side with clouds, as it would appear in life. Bottom right: The continent Aeneas at the east terminator. 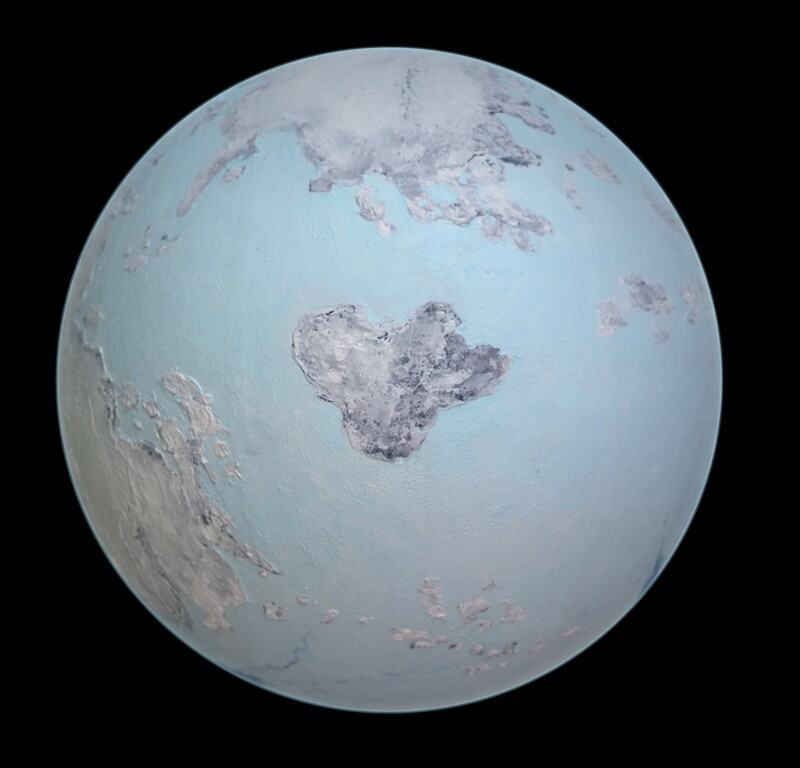 Ilion’s present climate is wholly dependent on the presence of a shallow ocean at the substellar point. 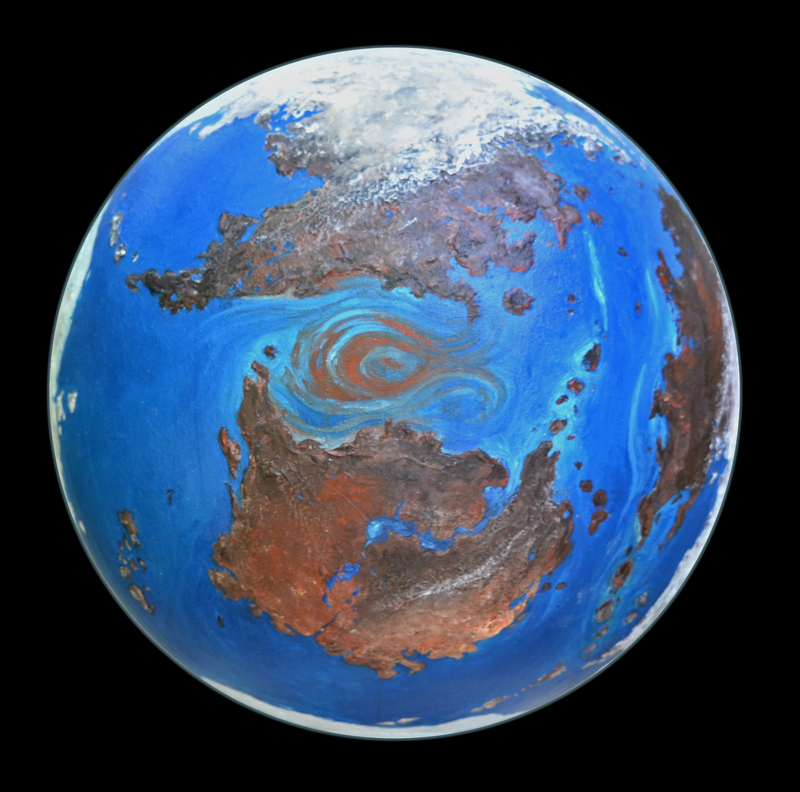 A tidally-locked planet would look very different if there were a landmass here instead. The land would be extremely hot and dry at zenith, leaving only a ring of habitability between the substellar point and the terminator. Ilion is not that way. The sun’s heat and air currents whip the humid air at the Greater Ajax Ocean into a permanent, stable tempest. Periodically, a secondary storm will split from this system and head toward the continents. Of these, the hardest hit is Aeneas, where rainstorms supply the forests with water beyond what the trees produce themselves. Every so often, a storm travels in the other direction and makes it all the way to Polyxena. Near the west terminator, these rogue storms mix with the cold subterminator air and manifest as blizzards of biblical proportion. Polyxena’s climate is highly sensitive to changes in stellar output. At times, conditions render it uninhabitable. The continent’s few permanent residents must cope by migrating, hibernating, or sowing seeds that wait for favorable conditions before sprouting. Heat circulates around the globe through the ocean as well. Four major currents radiate from the substellar point near the surface, carrying warm water to the other side. The currents encroach on the antistellar sea ice at four points known as the Four Corners. Cold water returns to the light side in two ways. One way is through sea currents deep down where the water is coldest (4*C). The other way is by the migration of sea ice. As the ice thickens it pushes outward until it reaches the Four Corners and returns to the ocean as liquid water. Mentes lies directly opposite the substellar Greater Ajax ocean. It receives very little precipitation and therefore has more exposed rock than other darkside landmasses. Mentes is of great interest to geologists for this reason and more. The Valley of Eras is especially tantalizing; The ice that fills this valley goes back millions of years and has not received more than a few meters of snowfall since 20 million years past, when the continent was closer to the terminator. 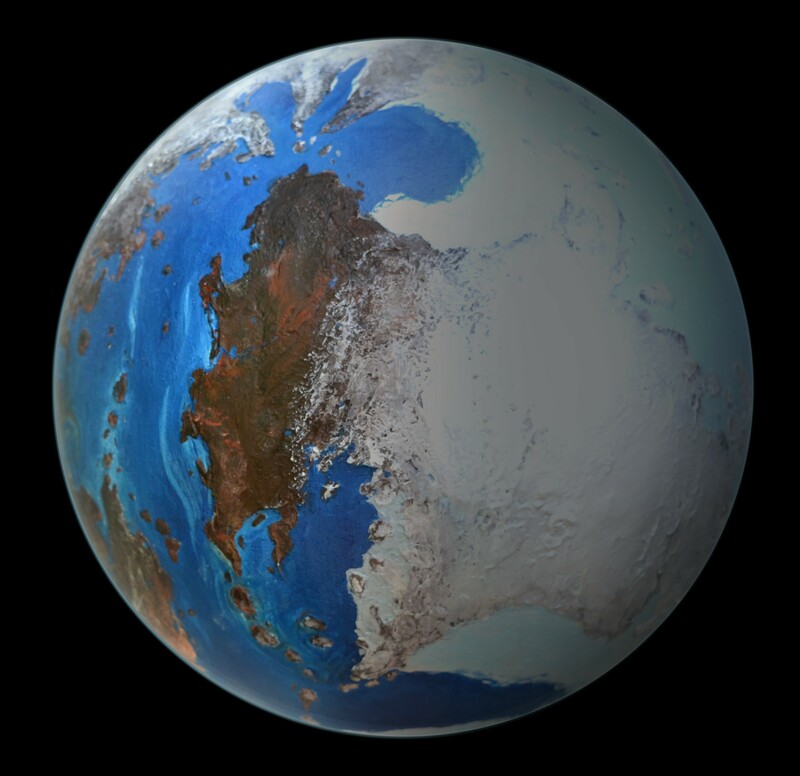 The site was a candidate for Odyssey II but Ilion International opted for Polyxena instead, so they could continue to study the planet’s biosphere. Skirting the edge of habitability, Polyxena is host to a few resident species and many migratory ones. It is the second smallest continent. Polyxena receives a lot of snow, so much that its accumulated weight forces it back to the sea as glaciers. One of these, Rorschach Glacier, bleeds black algae at varying points along its length. The alga is extinct. It dates from a time when Polyxena was closer to the sun, and would, in its heyday, turn entire lakes and streams as black as tea. 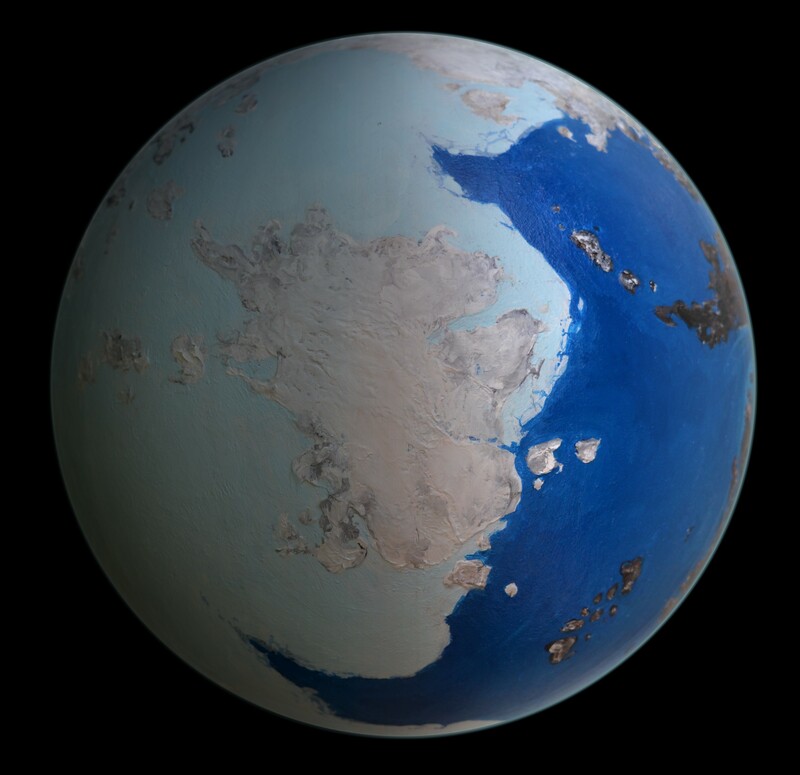 Geologically speaking, Deiphobus is two continents. The bottom half was once part of Pandaros. The land bridge that connected them in the past is underwater and visible only as a shallower portion of Greater Ajax and a few islands. As the plates migrated toward each other, they collided and formed the Arcadian Mountains. North of the range is the Great Deiphobus Desert. South is a variety of lush habitats including rainforest, temperate forest, alpine, and rash, a biome unique to Ilion. Aeneas’s sunlit half is exceptionally wet. Its rainforests sit in pools of water that can be quite deep in places. The water is rich in chemicals that sustain diverse microbial colonies but render the forest floor hostile to plants and animals. Like Deiphobus, Aeneas has a mountain range that divides the continent into clear halves, with very little life surviving east of the range. A particuarly interesting feature is Elephant Gulf. The gulf is partly enclosed in islands and peninsulas. Warm, humid air turns to fog here which creates a unique habitat for island and coastal life. A brownish swirl in the substellar Greater Ajax ocean would be visible from space if the cloud cover weren’t so heavy. The swirl is made of the same sort of floating vegetation found in rivers and lakes, but is adapted to a turbulent sea. Despite the name, it is not a single mass but a collection of separate “plantbergs” all caught in the same vortex. Several of these bergs are large enough to support populations of grazers, but most animal life lives within the tangle of vines, leaves, and buoys rather than on them. Once two separate continents, Pandaros is splitting up again. 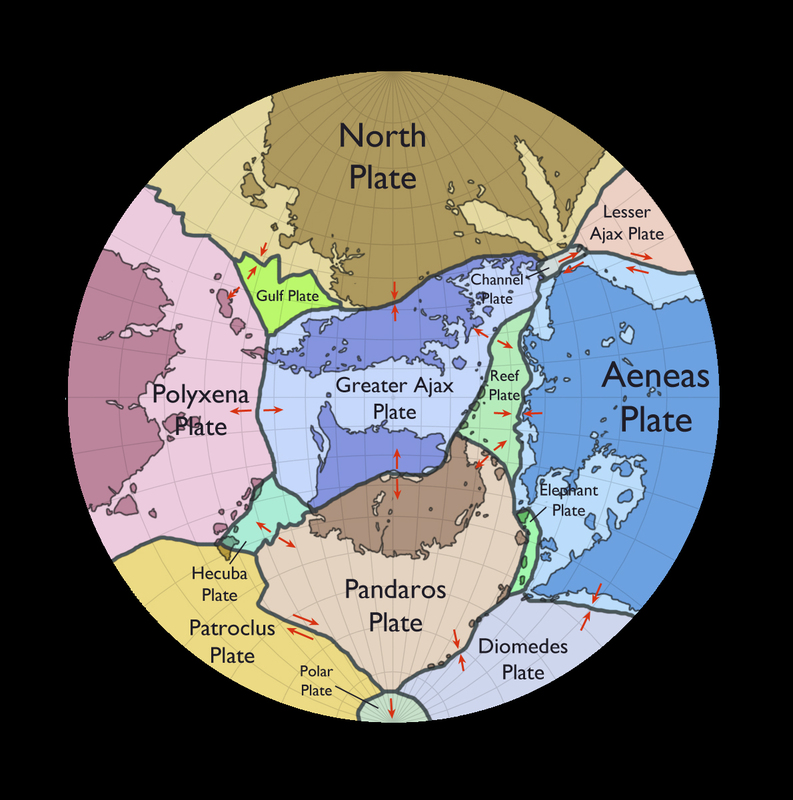 A divergent plate boundary runs diagonally through the heart of the continent. An ever-growing rift valley collects huge volumes of water from the mountainous rainforest terrain surrounding it. The water drains to the ocean through a chain of lakes and rivers. Rift Ria, where the water meets the ocean, is less salty than Earth estuaries due to the lack of tides. The Trojan queen Hecuba had nineteen children. Likewise, there are nineteen main islands in the Hecuba chain. They are unnamed, known only by their six digit designations. The chain is ancient and most of the volcanoes are inactive. Collision of the Aeneas and Reef plates raised a mountain range across the neck of Aeneas, halfway to the terminator. East of the Myrmidons is mostly barren, but the west is rich in rivers and glacial lakes.